I love watermelon. It is one of my favorite things to eat on a hot summer day. I know summer is here when I start seeing the piles of watermelon at the local supermarket. But how do you know if the watermelon you want is ripe and sweet? Check the ground spot. Look at the spot where the watermelon was growing on the ground. If it’s yellow looking or more creamy in color then the melon is ripe. If it’s white then it wasn’t left in the field long enough. Get the one with the creamy ground spot. Look at the stripes. The more the stripes are spread out toward each other the more ripe the watermelon is. I was once told that if you look at the stripes and see lots of white mottling in the stripes this means the watermelon is sweet. I used this technique for choosing this watermelon and it indeed was sweet. More personal research will be required however. Rub the watermelon. If it feels smooth then it’s not ready. If it’s rough with knots then it’s ripe. Hopefully these tips will help you pick the most awesome watermelon to rock your summer day. Watermelon contains more lycopene, a powerful antioxidant, than fresh tomatoes. Watermelon is virtually fat free. Watermelon is low in sodium. 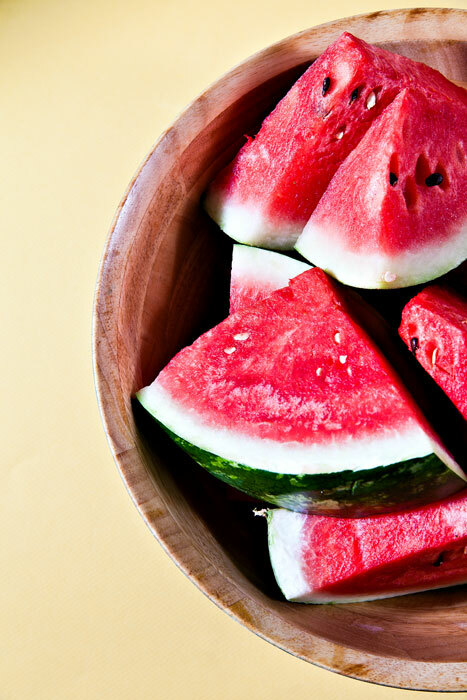 Watermelon is a good source of vitamins A, B6 and C.
Watermelon can help keep you hydrated; it’s 92 percent water. Watermelon can aid cardiovascular function with amino acids such as citrulline and arginine, which help maintain your arteries and blood flow. A 2-cup serving of diced watermelon contains 80 calories, 270 milligrams of potassium and no fat calories. Really? Really? Can you make them look any more delicious? I will certainly try Joel! This one came out really well considering it was late at night and I was really tired and unmotivated.